For a long time since I have been watching cricket India has been labeled as poor visitors(Strictly on cricketing terms :)). The famous title given to the Indian team by the media was “Tigers at home and Paper Tigers abroad”. The Indian team in the past have struggled when they toured as they took too long to get acclimatized to the conditions. When they evetually get used to the conditions it would be too late. I remember watching India tour Australia in 1991/92 and later 1999/00, hoping that there will be some resistance from the team but got really dissapointed as we lost badly on both occasions. In 2000 when Sachin resigned as the captain of the Indian cricket team following bad performaces by both the test and one-day squads. Sourav Ganguly got appointed as the captian of the Indian team in the later part of 2000. It was really a difficult time for all captains in the world due to the match fixing scandal. The game itself needed some faith reinstalled among the fans by the players around the world. India’s first overseas win abroad after 1993 came in Bangladesh when the defeated the home team by 9 wickets. The win in itself was not much to write home about as the team was expected to defeat the latest entrant to test cricket. The Indian team under Sourav did not have a great 2001 losing all the away test series which included a 2-1 loss to Srilanka. The end of 2001 brought about one of the greatest test series I have ever witnessed on Indian soil when India took on Australia in a three match test series. India emerged victorious by a margin of 2-1. 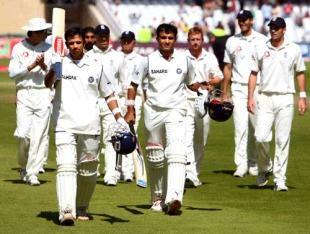 The series will always be remembered for Harbajan’s 32 wickets and also the great partnership between Dravid and Laxman in Eden Gardens where India came back to erase a 272 runs first innings deficit to eventually win the game. That series in India, kind of sparked a turnaround for cricket in India. Australians were the best team in the world and had come to India with a proud record of 15 straight test wins. After that series India had two new stars in Laxman and Harbajan. The Indian team went to Zimbabwe with the hope to win their first test series outside sub-continent for 16 years but lost the second game after the winning the first convincingly to return with a 1-1 draw. Similar fate followed when they toured WestIndies where they again sqandered 1-0 lead to eventually lose the series 2-1. Even though we were losing all these series the one good thing about them all was that India were winning test matches abroad if not the series. Since I started watching cricket India have never won a test match outside home except for one series in Srilanka in 1993/94. India had good wins in WestIndies and Zimbabwe and had a great world cup in 2003 reaching the finals. I would attribute most of the success prior to worldcup to the Ganguly and Wright combination. The Indian team had a great tour to England where they won the one-day series and drew the test series 1-1. Ganguly was great with the youngsters in the team and he instilled an aggressive intent in team which was lacking when we toured in the past. The Indian team were no more a pushover and also started to believe that they can do more than just play a part. After the world cup India had a good year where they went to Australia and had a great time returning with a draw in the test series. Later in 2004 Ganguly’s team won both test and one-day series in Pakistan. The Indian team was doing great with emergance of Sehwag, Yuvraj, Dhoni,Zaheer and Pathan. The Indian team had few problems in 2005/06 with the exit of the coah John Wright and the Captain Sourav ganguly almost at the same time. Greg Chappel took over as the coach of the Indian team and Rahul Dravid was named as the captain of the team. The team had a bad 2006(Expect for their first series win abroad since 1986 when the defeated WI 1-0) which carried over in the world cup where they lost in the first round. Since then the team led by Rahul Dravid has been fighting to spark a turnaround with Zaheer returning into the team and the emergence of Sreesanth, Munaf and RP Singh. Greg Chappel resigned after the World Cup debacle but Rahul Dravid still carries on without a coach for the team. As I write this article the Indian team is in England winning the second test in trent bridge leading the series 1-0 going into the third test in Oval to commence on Aug 9th. The Indian team would want to come home victorious by winning the test series in England which would be their first since 1986. The Indian team has won 16 test matches abroad since 2000, a record only bettered by Australia who are sitting pretty with 26 test wins. The tag of “Paper Tigers” was given by the media in the early and late 90’s and deservedly so as the team struggled to put up even a fighting performance overseas leave alone winning a test match. The tag has been lifted since the new millenieum due to efforts of John Wright, Sourav Ganguly and currently by Rahul Dravid who are making sure that when the seniors in the team retire the Indian team is one of the best in the world. Sachin, Sourav and Rahul derserve to be a part of a good team for their services in the last decade. I hope that this year turns out to be the stepping stone to the same. The Indian team’s first goal would be the series in England and then the home series against Pakistan before the take on the Australians later this year. I sincerely hope that the Indian team emerges victorious in all their future series and keep adding to the tally of 16. Go India!